CFN - CALIFORNIA FIRE NEWS - CAL FIRE NEWS : Arizona: AZ-ASF-Wallow - Wildland Fire - 469,407acres, 20% contained. Arizona: AZ-ASF-Wallow - Wildland Fire - 469,407acres, 20% contained. 32 Homes destroyed, thousands remained threatened. Firefighters have achieved 20% containment of the 469,407-acre Wallow Fire. While the Wallow Fire is now the largest wildfire in Arizona's history, significant progress has been made towards containment. Fire Operations: Firefighters continued with patrol, structure protection, containment line improvement and mop-up across the fire. Firefighters are coordinating with local fire departments to remove hazards in preparation for eventual reentry by evacuees. Containment lines around South Fork and Nutrioso are being strengthened. Mop up, patrol and hazard tree removal continues in Alpine, Nutrioso, Tal Wi Wi, Greer and South Fork areas. Burnout is proceeding east of Alpine, bringing fire south along a dozer line from FR 220 to US 180. Crews are continuing construction of the 9 - 10 miles of indirect line on the 33 Trail between McBride Canyon and Hwy 19l. Areas south of Black River on the San Carlos Apache Reservation are still holding. Air Quality: Smoke was visible from a strategic firing operation near Luna Lake. Burnout is one tool firefighters use to help slow the spread or change the direction of a fire. Burning vegetation under the right conditions allows firefighters to better control both the intensity and the movement of the fire. When the fire reaches the treated area it typically slows its spread. As weather permits, crews will ignite unburned fuels in this area to bring fire down toward US 180. Helicopters dropped water on the fire in the Blue River area in the southeast flank. Tonight will be mostly clear with areas of smoke, and a low around 46. Northwest winds will be 5 to 11 mph, with gusts as high as 18 mph. Burned area response: The Forest Service and Department of the Interior Burned Area Emergency Response (BAER) Teams will be initiating assessments of the Wallow Fire burned area to evaluate post-fire conditions and determine if emergency stabilization treatments are warranted. The two BAER teams will coordinate their assessments and work with the Tribes and other agencies to address potential flood threats that cross jurisdictions. The communities of Greer, Nutrioso and Alpine remain evacuated due to continued active fire behavior in unburned islands within and around these communities. Hazardous burned-out trees, unstable slopes and rockfall, as well as burned out power poles are being evaluated and mitigated. Arizona Fish and Game has a Wildlife Emergency Hotline to report injured wildlife (632) 236-7242. 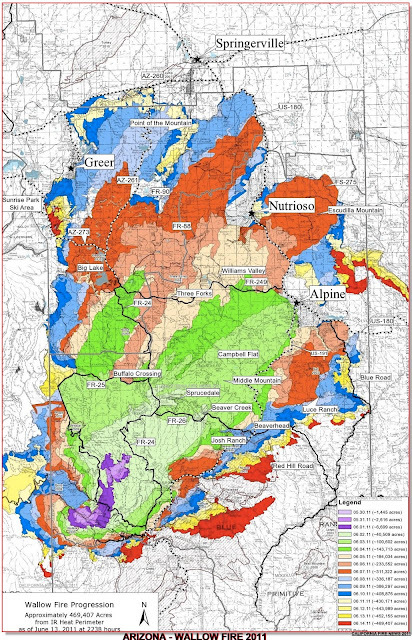 · Evacuations remain in effect in Sunrise, Greer, Blue River, Alpine, Nutrioso, and White Mtn. Acres. · An evacuee meeting will be held at 10 AM Wednesday at Blue Ridge H.S. in Pinetop/Lakeside. · The evacuation center is located at Blue Ridge High School, 1200 W. White Mtn. Blvd., Pinetop/Lakeside. The phone number for the Red Cross operated evacuation center is (602) 336-6660. · Residents with livestock or animals that need care should contact the Apache County Sheriff's Office (928) 337-4321 or the Greenlee County Sheriff's Office (928) 865-4149. A pre-evacuation alert continues in Apache County for Greens Peak, Hidden Meadows Lodge and surrounding areas. · A pre-evacuation alert by the Catron County Sheriff's Office continues for Luna, New Mexico. Residents in the communities affected by this fire are asked to remain prepared to evacuate. · US 191 is closed between Alpine and north of Clifton (milepost 176-253). · SR 261 (mileposts 395-413) and SR 273 (mileposts 378-394), the main access roads to Big Lake and Crescent Lake in the White Mountains, are closed. · SR 373 that connects the town of Greer with SR 260 west of Eagar is closed (mileposts 386-391). · US 180 is closed between SR 260 junction near Eagar and New Mexico state line (mileposts 403-433). · In southern Arizona, SR 366 is closed at milepost 118 leading up to Mount Graham (milepost 143) near Safford after the U.S. Forest Service determined the risk of wildfire is too extreme to allow access. · Partial area closures are in effect for the eastside of the Fort Apache Reservation. · SR 260 reopened today. Motorists are asked to drive carefully as heavy fire traffic may be present. Apache - Sitgreaves National Forest The Apache portion of the Forest is closed to all public entry. For the Sitgreaves portion of the National Forest, a temporary emergency closure order is in effect. For further information call the Arizona fire restrictions hotline (877) 864-6985 or www.publiclands.org/firenews/AZ.php. Gila National Forest: A closure is in effect for the western portion of the Forest in the Quemado, Reserve and Glenwood Ranger Districts. See http://www.fs.usda.gov/gila or call (575) 388-8201, TTY (575) 388-8497. White Mountain Apache Reservation: Fire restrictions remain in effect. · (702) 308-3238, (702) 308-3357, (702) 308-8227 from 8 A.M. to 8.P.M. Firefighters are burning vegetation between Wallow fire and the fireline north of road 180 in the Luna Lake fire camp area. This burnout will strengthen and connect containment lines in zones 1 and 2. As long as the current favorable weather conditions continue, the crews will ignite unburned fuels in the Luna Lake area and bring fire down toward road 180. Protection plans are in place for Luna Lake firecamp. If needed, for personal safety related to smoke or fire suppression actions, personnel may temporarily leave the fire camp. Residents in the area around Alpine, Luna Lake and Luna may see more smoke than usual from this operation. Active backing fire with isolated interior torching and short uphill runs where topography and winds align. Continue burnout NE of Luna Lake to secure east flank. Burned-out interior islands south of Eagar. North Zone - Continue burnout NE of Luna Lake. Continue securing communities already impacted by fire. Maintain perimeter control by mopping-up. Continue hazard tree falling around communities and vital access roads. Begin fire suppression repair efforts. East Zone - Structure protection, continue to strengthen and secure lines, prep lines for burnout, scout line locations to meet control objectives. West Zone - Continued firing with IHCs and aerial ignitions operations on Divisions Z, Y and KK to the indirect line. · Springerville, Eagar, Greer, Alpine Media # (480) 331-9554.